Nothing is lost by taking time and enquiring into your cycle, actually, you’ll achieve a greater understanding of yourself and gain an ability to work with your natural cycle for better holistic wellbeing. I encourage you to have an open mind as you read and start to feel the changes each week in your cycle. Don’t doubt anything you feel, trust your intuition. When I first heard about what a woman should and shouldn’t do during her cycle, I was twenty years younger and thought it was archaic and out of touch with my sassy life. As I’ve matured in age and experience, insight and love, I’ve come to realise the beauty in my cycle as it gives me insight into my health, both physically and mentally each month. There are poses we can do to remedy or improve our cycles. Traditional Chinese Medicine and Acupuncture have helped me to understand my cycle. Traditional Chinese Medicine (TCM) has been around for many centuries, way longer than we have had allopathic medicine. I find its theory of Yin and Yang ‘energy’ which is called Qi easy to relate to and I can use my yoga practice to influence, improve and maintain my health. We females are fluid, receptive, intuitive and tend to embody a yin energy, which is grounding, calming and soothing. Men embody all that is yang. Yang, by contrast is associated with being action-oriented, goal-driven and forceful. Of course, we all have aspects of both yin and yang qualities, whether female or male. As women, we benefit from honouring our yin nature in order to "go with the flow", keep the body soft and soothed and to maintain our hormonal balance which then helps our mental and physical health. To practice with your cycle is to respect what subtle changes are going on and adjust accordingly. At the center of the TCM principle is Qi flow, which directly effects how our blood flows. Yoga facilitates a smooth flow of blood and Qi around the body, it helps to maintain a balanced endocrine system and my experience of practicing with my cycle allows me to live a more balanced life. To practice with your cycle is to respect what subtle changes are going on and adjust accordingly. Where you live, if you’re travelling, your genetics, your age, what you grew up eating, you emotional body and your approach to live can all affect your cycle. The beauty of every cycle is that it’s different most months, so when you ‘read’ your cycle you will have monthly up to date data on your health and wellbeing. 1st Phase - Menstrual phase (day 1-7) Reflect. This first part of your cycle when you are bleeding is a time to nurture and support your body. Your hormones are at their lowest level and you may feel physically lethargic. It should be the stillest of the 4 menstrual phases, a time to slow down and allow the yin nature to be dominant. 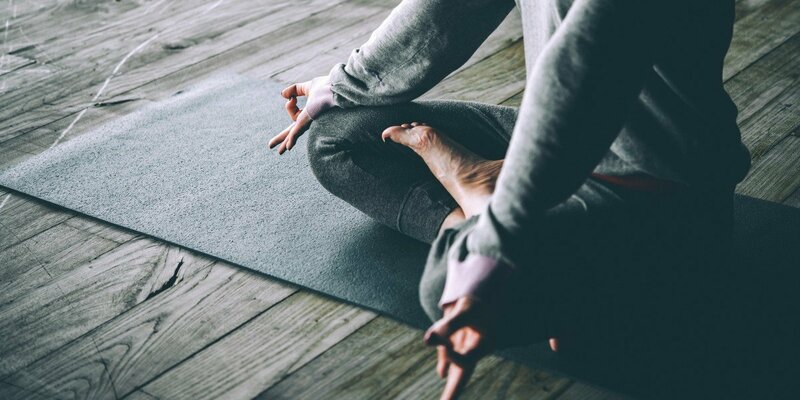 This is the week to take off a few 5.30am gym sessions, miss that late night power yoga and replace it with a lie in and a Yin Yoga class, reward yourself by nurturing and soothing the body. It’s a time when we can reflect and capitalise on a deep state of mind that this phase brings about and time to set your intentions for the coming month. A gentle cleanse for the body, reducing intake of toxins, such as sugar, caffeine, alcohol, fatty foods also helps this Yin phase. Your yoga practice in the bleeding phase should reflect a stillness to enrich your body, so practice mainly lying and seated poses, with maybe just one or two standing poses, and a mediation to help you to stay grounded and balanced in mindbody. Spend time in poses letting go, listening and feeling into the body. Stillness is of paramount importance during this time, however society doesn’t let us be still because we are bleeding, and we are expected to push on through, but without resting, we become tired and stressed which carries through into the next part of our cycle, potentially increasing PMS later in the cycle. Inversions and core work are not needed during this softening phase, but if a bit of movement feels good, try slow, dynamic vinyasasas. This is not a time for Hot Yoga, Power yoga or any activity that stresses the body or mind. Below are some suggestions for this first phase. Please remember if you have any injuries you should be advised if yoga is correct for you at this time. If you’re not sure, please email me or consult an advanced yoga teacher. I’m not a doctor but I have worked one on one with many conditions and injuries. 2nd phase - Follicular phase (day 7-13) Rise. The focus for a yoga practice after the bleeding stops can change as the Qi changes from downward and inwards to expansive. Remembering your intention you set earlier in the month, re-intend it, and why not blaze some new trails, try a new class like Acro or Ariel Yoga. Your practice can become more strengthening as you move towards the third phase where the yang aspect is becoming dominant. Start your practice in stillness, encouraging a moment of mindfulness, tuning in and seeing exactly how you are and where to go from that. Cat cow is a great way to get movement into the spine, feeling the breath rising and falling as you curl and arch the spine. Alternate leg and arm lift on all 4’s follows on nicely, which if done correctly is great for the core, strengthens the upper body and helps with balance. Then start to add sequencing depending on how strong you are feeling, how dominant the yang is over the yin, you can bring in various warriors, lunges and balances. The focus is more about listening to your body, seeing if it wants to go for it, or your energy isn’t quite there yet. In this cycle you can gradually build up to bringing back inversions, stronger core work and big back bends. 3rd phase - Ovulation phase (day 14) Peak. On the 14th day of the cycle, or around this time the pituitary gland secretes a hormone that causes the ovary to release the matured egg cell. The released egg cell is swept into the fallopian tubes and moves on down towards our uterus. Usually on Ovulation day we feel strong and energetic and if that’s the case this is exactly the right time to pull out all the stops in your yoga practice, make it more Yang. It’s the prime time to burn energy as your hormone levels are peaking. Explore new poses you thought were way too difficult (obviously under expert guidance), try a faster Vinyasa class, or a Hot Yoga class. It's a good time for elongated balances, like Warrior 3 (aka Virabhadrasana III or Eka padasana) which test and compliment your inner steadiness. Arm balances such as Bakasana, Astavakrasana. Personally ovulation can sometimes be a day where I have symptoms close to PMS, bloating, tenderness and pain. If this happens, its usually because my first 5 days of my cycle weren’t still or reflective enough or I’ve eaten badly, not slept enough, been too stressed out, over emotional and all of these have direct impact on my cycle and I feel it. My body, thankfully signals to me to take a bit more time, to take more care, drink more water and release and relax. If I care correctly for my body now I suffer less from PMS in the last phase of my cycle. I go back to my slower practice for a few days, allow ovulation to pass and then gear up again. Breathing or pranayama practices help balance the body, calm the nervous system and can improve sleeping patterns, encourage focus and help to direct our Qi correctly around the body. A good pranayama is Nadi Sodhana. This can be a strong practice so make sure your blood pressure is OK and don’t do it when you have a cold. 4th phase - Luteal phase (day 15-28) Reflect. After ovulation the hormones are transitioning in preparation for your bleed again. You may experience increased energy during the beginning of this phase, and then a need to transition to lower impact, less yang more Yin toward the end. Start with a Heated Vinyasa and end the phase with a slow Hatha class. Discover what your body craves. If you start to feel PMS at the end of this phase I’d advise trying gentle but rhythmical, dynamic sequences such as surya namaskar. As the transition of the hormones occur we can support our system with poses to stimulate the Qi flow. Poses such as the Yin pose Sphinx which work the kidneys and the adrenals are great at this time. I use Yin as well as yang yoga helping to move energy around my body and keep me balanced and grounded. Keep in mind, these phases will vary in length from person to person, but paying attention to your body will allow you to maximise your unique potential during each part of the cycle. With so many types of yoga available to try, whether it's indoor or outdoor, in a group class or an online video at home, there will always be a variation you can seek to meet your needs. Relax, have fun, and enjoy the positive effects of a regular yoga practice. It has been proven that its not the intensity of a practice that helps to maintain wellness, but the regularity and ability to work with ones body. Our practice should give us the energy to do everything we need to do in the day; it should not make us want to go back to bed. It should make us peaceful, instead of robbing us of our peace. It should make us less stressed rather than adding to our stress levels. It should support a positive outlook and a balanced way of life, rather than promote unhealthy patterns and behaviours. Supplement your yoga practice with a nourishing omega rich joint supporting oil. Support energy production throughout your cycle with vitamin C and a energy supporting formulation such as higher nature wise woman. Muscles love the relaxant properties of magnesium so add some magnesium salts to a bath or foot bath for post-class support. Davina has been teaching yoga for fifteen years. She has over 800 hours of training in a variety of styles and works mainly with private clients in London and Ibiza. She also teaches mindfulness meditation and is training to be a core psychotherapist. She is happy to create personal video sessions, created specially for you to do at home.